With garden season in the Southern Hemisphere getting underway, we’re offering a popular workshop on eco-effective, beyond-organic gardening. Below is a draft for a book proposal that I wrote two years ago before my thesis writing got underway. It should provide an idea of the 4 dimensional design and management strategies we employ in our carbon positive agriculture. Garlic planted just wider than a stirrup hoe. Weed management is the greatest challenge to both large scale organic farming and the home gardener. 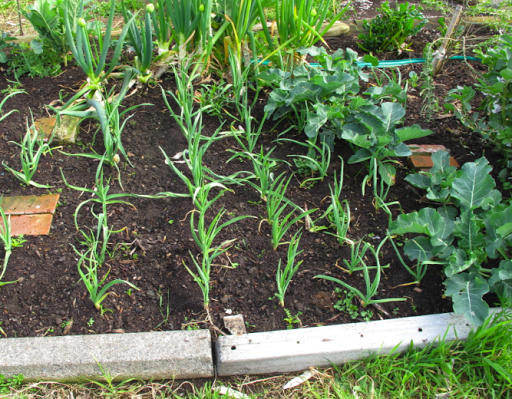 Many home gardeners abandon their vegetable patches because they fall behind on weeding and then get overwhelmed. I’ve seen it happen over and over again. It’s a pity because this is completely unnecessary if the garden is designed well in the first place. Planning a garden around weed control may not sound exciting, but the result can save hours of drudgery and frustration, and potentially abandonment. It can make the difference between success and failure, and may mean the difference between a novice giving up after one attempt or making gardening a lifelong passion. For the experienced gardener it means doubling or tripling the size of a vegetable patch with no additional time commitment or expensive mulches. Low/no maintenance edge even with invasive grasses. Over the course of ten years I have developed a highly effective organic weed management system that also breaks insect pest and disease cycles, builds soil fertility, and cuts down on watering needs. It is also inexpensive to establish and maintain. The original system, designed for cold climates, relies on a four year rotation in beds from one square meter up to a quarter acre. For milder climates, I’ve modified the system to accommodate six half-yearly rotations over the course of three years. In both systems, an extra year of cover crop/green manure can easily be added if desired. Rocket (arugula) as cover crop and seed bank. In an era of rising energy prices, economic volatility, and changing climate it is significant to note that one person can manage up to an acre of vegetables using only hand tools. Forget carbon-neutral. This is a carbon positive system, as it uses no fossil fuels and actually sequesters carbon in the soil. By converting lawn into garden beds, concerned citizens of planet earth can save time, money and carbon by not mowing, and simultaneously increase their personal food security. Anyone can turn high maintenance/low productivity landscapes into low maintenance/high productivity foodscapes. The keys are design, timing and tools. It is human nature to blossom at the possibility of building something new, but to wilt at the thought of ongoing upkeep. People tend to love projects but hate maintenance. This system is designed with that in mind. The system harnesses natural energy flows, including human energy. After the initial design and construction, ongoing maintenance is kept to a minimum. Time spent on weeding, watering, and pest control are all reduced. The result is more food calories grown on fewer food calories (and no fossil fuels) burned. I have traveled the world looking for examples of sustainable agriculture and have found few better. Where conventional agriculture requires up to 20 fossil fuel calories burned for every food calorie produced, this system reverses those figures. It produces a net energy profit, instead of loss, and uses no fossil fuels at all. Chicken tractor 1.2 meters wide – same as the garden beds. The system relies on thoughtful design, the right tools, and proper timing. It is a low budget system as it relies on a few high quality tools that will pay for themselves many times over in time savings and food production. I developed the system on my farm in Andover, New Hampshire. During my time there, Pedal Power Farm was over 95% energy independent. Keeping costs low and productivity high is crucial to any small-scale farmer. This system is ideal for anyone growing produce in four square meters up to an acre. Roofing iron placed temporarily to weaken couch and kikuyu grasses.